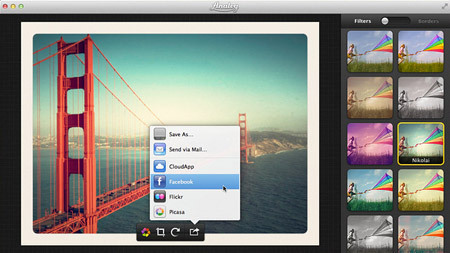 Analog is a new photo processing application on the Mac App Store. With one or two clicks you can turn common snapshots into classic, retro-styled photos. With a nice selection of artistic filters, Analog makes image manipulation and sharing a breeze. Analog, developed by Realmac Software, is now available on the Mac App Store for $7.99. With services like Instagram taking off, there’s a lot of interest in retro photography right now. And for good reason! Applying stylized filters infuses photos with personality or, as the developers of Analog would say – soul. There’s no doubt that’s exactly what this app can do with seemingly mundane images. Optimized for Lion’s full screen and restore features, Analog presents a very Mac-like experience. It’s user interface is incredibly simple with a preview area on the left and a filter gallery on the right. There’s also a switch to toggle between filters and border styles. Getting started is as easy as dragging a photo to the Analog window and clicking on a filter to see the results. Analog’s ease-of-use really empowers you to experiment with different image styles until you find just the right one. There are 20 filters and 14 borders to choose from, which is enough of a variety to get the desired effect most of the time. You can also crop and rotate photos by hovering over the image and clicking the appropriate icon. When you’re all done, Analog has sharing capabilities built in. You can save, email, or post your creations to social networks like Facebook, Flickr, and Picasa. While Analog does make modifying your photos extremely intuitive, there are some tradeoffs. For example, applying filters with one click means you can’t adjust or customize the effects. They are what they are, so some work for certain photos while others do not. In addition, Analog seems to require serious horsepower for such a seemingly simple app. Messing around with filters on a few large images brought my MacBook Pro to a crawl. The developer is aware of these issues, though, and plans to include a fix (and new features) in an upcoming free update. In summary, if you’re looking for a quick and affordable way to stylize photos on your Mac, Analog is definitely worth checking out. It’s available now exclusively on the Mac App Store for $7.99. Win a free copy of Analog for Mac! The developers of Analog ($7.99 on the Mac App Store) have been kind enough to offer a free software license to one lucky MacYourself reader! We’re going to try something new and take the giveaway to Twitter this time. To enter, simply mention @analogapp and @macyourself in the same tweet with a link back to this article (http://bit.ly/o8Gu3q). All entries must be made by October 26, 2011 at 11:59pm eastern U.S. time. At the end, we’ll gather all of your tweets and pick a winner at random! The lucky guy or girl will be announced on this page, so save this article’s URL and be sure to check back later. In the meantime, check out Analog on the Mac App Store to learn more about its features. Good luck! Congratulations to our winner, @xJaredCummingsx! His tweet was randomly selected and he has been given a free copy of Analog for Mac! Thanks to everyone who entered and remember to consider purchasing a copy of Analog on the Mac App Store.